Chicago residents often talk about how riding a bike is the quickest way to get around the city’s most congested streets. Well, a recent race in Portage Park proved it. 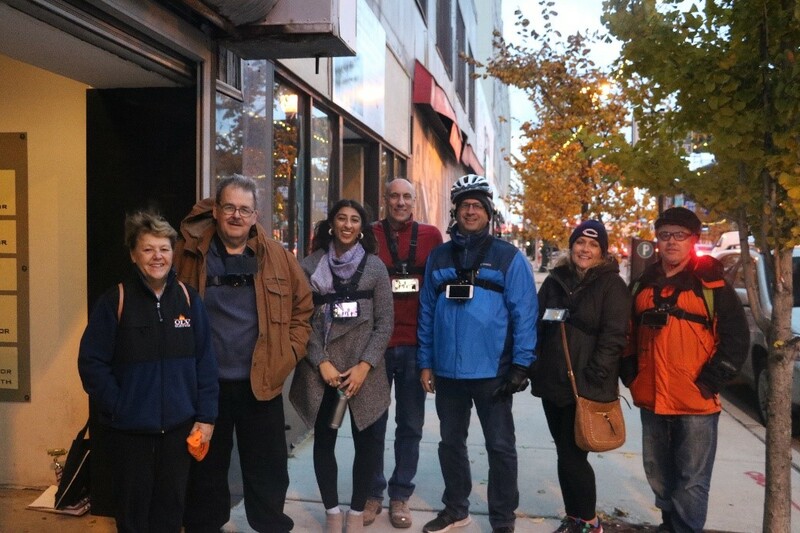 The Six Corners Association and Active Trans recently hosted a Multiple Modes of Transportation Race from the Six Corners intersection of Cicero Avenue, Irving Park Road and Milwaukee Avenue to the Irving Park Blue Line Station and back during the afternoon rush. The “racecourse” was one mile each way. Race contenders are pictured in the photo here. 45th Ward Alderman John Arena (in blue coat) finished first while using a Divvy bike (hurray for Divvy! ), and was closely followed by the participant on his own bike. The bus rider finished second to last, just barely beating the person walking. This race was held in order to spark conversation about much-needed improvements to the 80 Irving Park bus route. The bus gets stuck in traffic and at red lights while carrying about six times more people than the cars and trucks it regularly gets stuck behind. Poor quality service frustrates riders and can lead to people abandoning the bus for less efficient, affordable, healthy and green options – making congestion even worse. In Chicago’s first-ever Bus Friendly Streets Report cards released by Active Trans last month, the Irving Park bus route garnered a D and the 45th ward received a C. Like so many other Chicago bus routes, there are clearly some speed and reliability issues with bus service in this corner of the city. See the full report for the full assessment of the Irving Park Bus and the 45th ward. You can also take a look at how your own ward or preferred route measure up. If you use buses in the Six Corners area, the Six Corners Association wants to hear about your experience taking the bus so we can work together to fight for service improvements. Please help us understand how to improve the 80 Irving Park Bus by taking this 10-15 minute survey. If you’re interested in getting involved in advocating for prioritizing buses on Irving Park Road or a corridor in your community, sign up to become a Back on the Bus Volunteer. This post was written by Emily Norkus, Active Trans Advocacy Intern. Watch a short video that was created during the event.